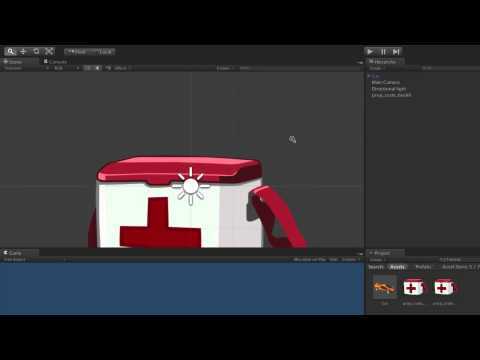 The Unity Editor and Screen View can be optimised for 2D. This video is a quick overview of both Editor Mode: 2D and Screen View Mode: 2D, how to use them and how it helps with the 2D workflow. Unity supports 2D projects as well as 3D projects. by selecting Setup Defaults For 2D. and the default editor mode will be set to 2D. editor mode with the 2D scene view mode. 2D and 3D views of the scene. Importantly these 2 settings are independent of each other. with the 2D mode button in the header bar. between 2D and 3D mode. The editor mode can be changed at any time. project is Default Behaviour mode. with an orthographic size of 5.
game being built in the editor. 3D elements in the same game. view compared to 3D mode. and negative values down and to the left. in the scene there are transform tools in the menu bar. the Rotate tool and the Scale tool. or by using a shortcut key. Q, W, E and R keys. in the same order, left to right. Q is the shortcut key for the hand tool. W is the shortcut key for the translate tool. and R is the shortcut key for the scale tool. The hand tool moves the scene view. Click and drag anywhere in the scene to move the view. the control keys to zoom the scene view. and the mouse wheel can be used to zoom. game objects in the scene. click on a game object to select it. gizmo will change when the tool is changed. The translate tool is for moving game objects in the scene. is replaced by the sprite gizmo. it is possible to work exclusively with the translate tool. anywhere within the area of the sprite gizmo. rotate or scale the sprite. sprite gizmo near one corner. rotate icon appearing on the pointer. or the edge of the sprite gizmo. sprite will scale when dragged. By default the sprite will scale proportionally. or corner of the sprite gizmo. the rotation in 15 degree increments. and their behaviour is unchanged in 2D mode. sprite renderer and it's sorting layers.